For multiplayer games, the balance between fun gameplay, reward and progression is difficult to manage. As more businesses engage with the free-to-play model, there is an emphasized importance of attracting and keeping a large player base. For MOBAs (Multiplayer Online Battle Arena) specifically, getting players to try a particular game in an ever-growing popular genre is half the battle. For many, MOBAs intimidate and for others; struggle to grasp the finer details that give long-time competitors such an edge. However, MOBAs also maintain the strongest sustained player base and continue to rise with international support and popularity. Players who invest their time and money into the game, tend to dedicate their free time more and more exclusively to the specific MOBA over any other. Some only play that one MOBA exclusively. For this article, we will be scrutinizing the MOBA (Multiplayer Online Battle Arena) genre as it is becoming the most trending type of game of this generation. In addition to its growing popularity, MOBAs face several adversities that can overwhelm newcomers ranging from the amount of information it demands and its diversity in characters (Heroes, Champions, Characters), abilities and smaller game details. Nonetheless, its competitive nature and one’s ability to execute knowledge and expertise of a character into the game attracts an ever-growing audience. This knowledge, expertise and time is an investment that all games seek as it can lead to a sustained player base, purchases and continued use of the company’s digital platforms (Battle.net, Steam) or other products (Hearthstone, Team Fortress 2). Creating an interest for your specific game, engaging players to try it and ensuring they spend their time and, subsequently, their money is a divided technique. The MOBA genre is currently crowned by two popular games: Leagues of Legends (Riot Games) and Dota 2 (Valve) with a rising star by Blizzard Entertainment’s: Heroes of the Storm. Each game takes a different approach in their audience and creating forms of accessibility. Accessibility in terms of garnering interest from newcomers and easing them comfortably into the knowledge and world of MOBAs. 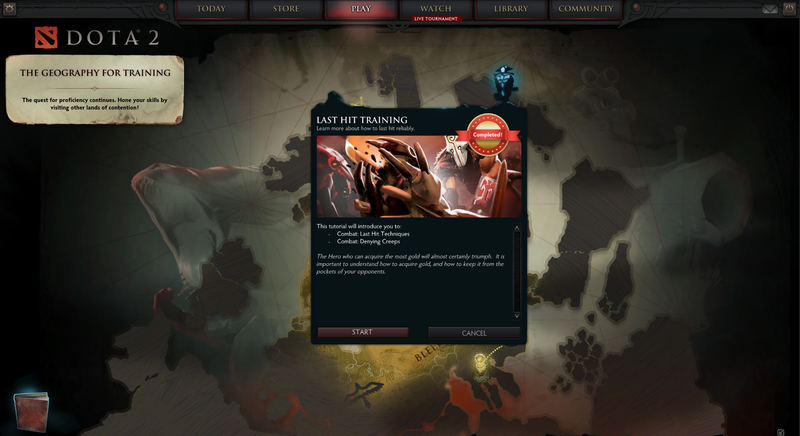 Tutorial and Training Sessions: Learn the basics of MOBAs, Dota 2 and basic general concepts such as ‘Last-Hitting’. Limited Heroes Mode: Reduce the number of heroes in a match to 20 in total. Creating less demand to know the intricacies of each hero and more about perfecting your understanding of the game overall. Bot Matches: Practice vs. AI before playing against other players to improve your overall playing ability. Coaching: More experienced friends can join your games as a coach, letting them speak to a new player in real-time, draw in their game and inform of them of areas to be careful of, etc. In-Game Hero Guides: Item and ability suggestions are highlighted and shown for players who choose to subscribe to the guide. Glossary of all Items and Heroes: All items and hero abilities are available for reference in-client with videos and stats. Dota 2 has an elaborate system to ease players into learning one of the more complex genres in the gaming industry. Smaller nuances such as vision/observer wards and map-awareness are left up to the player to delve into. For League of Legends, Riot Games introductory system for newer players is less complete but direct. They have two main tutorials: one involving the basics of the MOBA genre and the other about a typical game in League of Legends and using a quest system to guide players into completing their first match. In addition, there are bot matches to play vs. AI and an arching level system that lets players progress up to level 30 as more and more abilities become available for the players, easing them into knowing eventually every champion and Summoner Ability available. However League of Legend lacks in explaining their customization in terms of Runes and Masteries. They make up for it with their more intuitive Item Shop system where you can filter items that you want to buy depending on how you want to play your hero (Attack Power, Ability [Magic] Power, Magic and/or Physical Defense, etc.). Nonetheless, League of Legends assumes players will pick up on the finer details of the game as they play and progress through levels and matches. 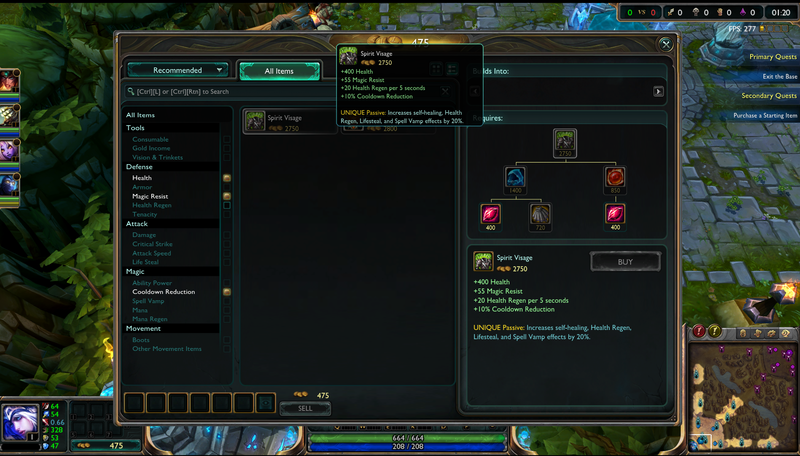 League of Legends’ item shop is straight-forward, intuitive and comfortable. However their tutorial may feel incomplete for newcomers to MOBAs and to League of Legends. 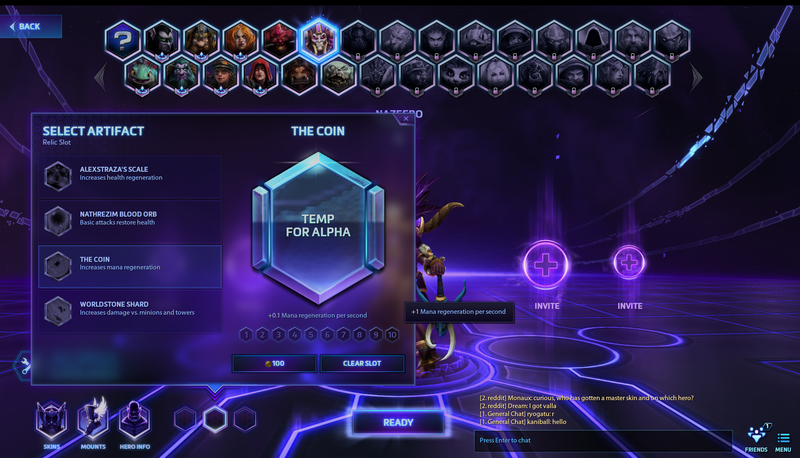 It’s important to note that Heroes of the Storm is still in a technical alpha with some of its features not yet implemented. However its approach to the MOBA genre is already clear: simplicity. Heroes of the Storm does away with a lot of the smaller intricacies in Dota 2 and League of Legends, going as far as to remove any and all items in the game and globally earning experience. Their tutorial system involves a fast exemplary game and playing vs. AI. 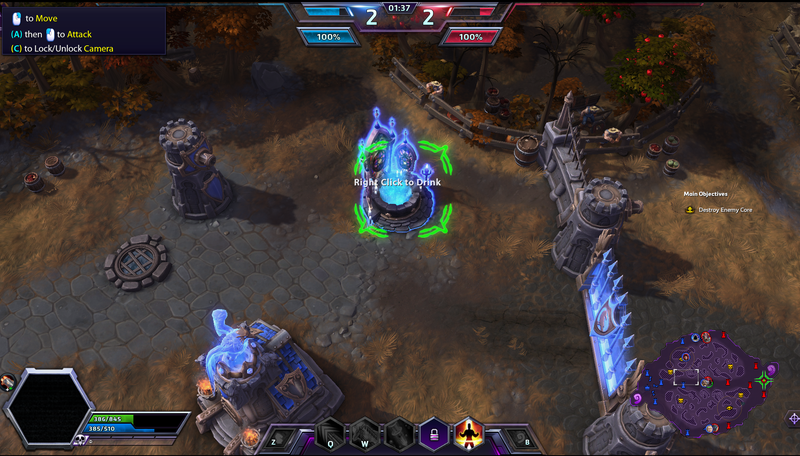 However, Heroes of the Storm goes further with their simplicity by restricting ways you can play a hero. ‘Talents’, a customizable form of altering a hero’s ability, is limited to two at the start and as you play more games, more unique ways to use a skill of a hero is unlocked. These fences around customization are for the benefit of the player, to avoid any overwhelming choices until the player has more experience with a specific character. Heroes of the Storm eliminates a lot of the smaller intricacies of other MOBAs for a more comfortable and casual feeling to the game where teamwork is more stressed over individual ability and work. These three MOBAs all create avenues to invite players into investing their time in their game. They create avenues of access that ease newcomers into trying their game via tutorials or simple game concepts. Although Valve’s tutorial system has the most pull in inviting players to invest their time into the game, it lacks forms progression or further motivation beyond ranked matchmaking. They compensate this by open-ended content with a full hero roster for players to choose from and no restrictions in game modes. Dota 2 is like a playground in which it is available to access and try (free-to-play) but doesn’t direct or orient people into what to play or how competitive they need to play (you can play vs. AI, ranked matchmaking or more entertaining modes such as ‘All Random’ – where players are assigned random heroes at the start). For League of Legends and Heroes of the Storm, there is a motivation for players to progress and unlock future content. Specifically for League of Legends, players want to reach max level for full access to abilities, currency to buy more heroes/runes/masteries and enter ranked matchmaking for the full competitive experience. Riot Games’ approach for new players is to orient them towards understanding all aspects of the game before allowing them to play their most regarded gameplay mode: Ranked Play. Create reasons or invitations for players of all backgrounds to consider their game. This can range from a competitive and challenging height like in League of Legends and Dota 2 (eSports) to quick, short matches with less demand of one’s time like in Heroes of the Storm. Motivate players to continue returning to your game. Ultimately it comes down to personal preference of the player but each game has an appeal from rotating champions and unlocks to the style of each match – League of Legends being more static in how Champions and each match should be played while Dota 2 and Heroes of the Storm are fluid. Convert that investment of time into purchases and additional content that does not segregate the community nor hinder one’s experience for not purchasing. This is where each games diverges and incorporate different philosophies. Limited Hero Pool: Newcomers will only have access up to 5 heroes out of 28 (with more to come). This free rotation of heroes is expanded as you play more and experience towards higher account levels (8 and 10). Limited Talents: Talents offer unique ways to customize your hero as there is no currency or items in the game. However, 50% of your talents are blocked until you improve each individual heroes’ level (by playing more games with the hero) to hero level 3 and 4 (“advanced talents” and “expert talents”). Limited Artifacts: Artifacts improves areas of your hero such as mana, life and movement speed. Artifacts, like Talents, are not unlocked until even further in the game (account level 15) which grants you the right to use Artifacts, but not the ability to do so. Artifacts have 10 levels each that have to be purchased individually furthering disadvantaging users over another. Heroes of the Storm is gated in many areas, inviting players into investing more time in the game to unlock features and advantages such as Artifacts (similar to the rune system from League of Legends), Talents for each individual hero and gold to purchase more heroes and each artifact level (up to 10 with the price incrementally rising per level). Heroes of the Storm goes overboard on player progression and removes curiosity of the game, its heroes and customization opting more towards a ‘commit or move on’ situation. While it is important to note that Heroes of the Storm is still in technical alpha, their direction in inviting players to invest their time (and money) is becoming questionable or perhaps even self-destructive. The concept of inviting players to invest is something all free-to-play games are trying to balance. How does a company keep the playing field fair and yet get a direct or even indirect return on their sizable player base? Accessibility is fast becoming the commodity in many games and MOBAs are no exception. In a recent Steam Dev. Days event, Kyle Davis from Valve Software gave a talk about in-game economies, player experiences and negative externalities. Valve’s Kyle Davis gives a talk about creating further value in purchasable goods that both enhance the enjoyment of everyone who plays with someone who purchases content and avoiding negative externalities where everyone’s experience is dampened by the person who purchases an advantage of sorts. In short, it is important to invite players into wanting to invest their time into playing your game through forms of accessibilities. Accessibilities include robust tutorials that contain the major details to the game, a fair diversity of characters/modes and the positive externality of purchasable content. Positive externality meaning that they do not hinder a player’s enjoyment but enhance others when purchasing goods. DLC is in a similar vein where players should feel that the DLC is an addition and enhancement to the game over a missing part of what would be otherwise a complete story or gameplay. Cosmetics such as skins are only considered once the player has dedicated enough time into a particular character they like. New maps and modes are only considered once the player has invested enough time into the game’s core mechanics to feel he or she can take advantage of it. Both Dota 2 and Valve’s other product: Counter-Strike: Global Offensive have hit a fine line of garnering interest in both playing their game and enhancing the experience of everyone when purchasing goods. For Counter-Strike: Global Offensive, if one of your members in your party has purchased an Operation token (access pass to more content), they gain access to a variety of new features (achievements/missions, cosmetics) as well as new maps that all players in their party have access to (so long as they play with them). Similarly, in Dota 2, players have access to new HUD cosmetics and voice packs if someone on their team has purchased (or earned) it. These small touches give a positive outlook and don’t make customers feel forced to purchase in order to have a little diversity in aesthetics or more maps/modes. Even if a customer never purchases anything from the product they are playing, it keeps them playing without feeling any advantages were withheld. So although potential revenue may be immediately unearned, long-term customers are kept and can be capitalized on in the future (directly or indirectly). Each company faces a monumental task when it comes to their MOBA and new subsequent games also faces that same monumental task of finding accessibilities that draw new users in and then methodologies to maintain that user base to ultimately capitalize on a small portion of it. Said avenues of accessibilities are commodities that need to invite players to invest their two currencies: time and, further on, money. Trust your audience in which you don’t restrict accessibilities when you can provide further options for them to consider. Long-term non-purchasing player bases can be capitalized on later, but disgruntled short-term buyers are difficult to bring back. These points are a direction that products, especially in the MOBA genre, need to establish and assure customers from the get-go. The balance of making sure it doesn’t fence content from everyone else or hinder their experience should one player purchase goods is another responsibility on the company’s behind these popular games. It’s practically the norm that MOBAs are initially free-to-play but additional costs can make or break the player base in more ways than one.